Founded in 1923 by four high school friends, the Weaver Aircraft Company went through many tough times. Early on the company was kept afloat by the Eskimo Pie and a candy recipe sold to the Russell Stover Company. Once they hit their stride, their best known aircraft was the YMF sport plane. This plane had a reputation of being the best and most beautiful open cockpit biplane ever made. With the passing of the biplane era, WACO finally closed its door in 1948. 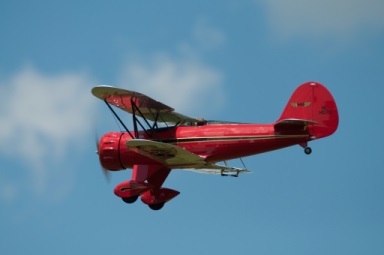 Fortunately, in 1984 a group of investors started the WACO Classic Aircraft Corporation and started building the YMF design again in Battle Creek, MI. The Waco is a 1/8 scale electric powered version of the YMF-5, designed by Jim Young. It features a scale structure with proper rib spacing and fuselage stringers. The power system is designed to slide out the nose for easy battery access. The traditional balsa and plywood construction features self jigging structures with the accuracy of laser cutting. The wing attachment uses a series of wire hooks and pockets in the wing ribs to make field setup up a snap. You can download the photo-illustrated construction manual from the "Instructions" tab. The kit includes full-size printed plans plus laser-cut balsa and plywood parts.